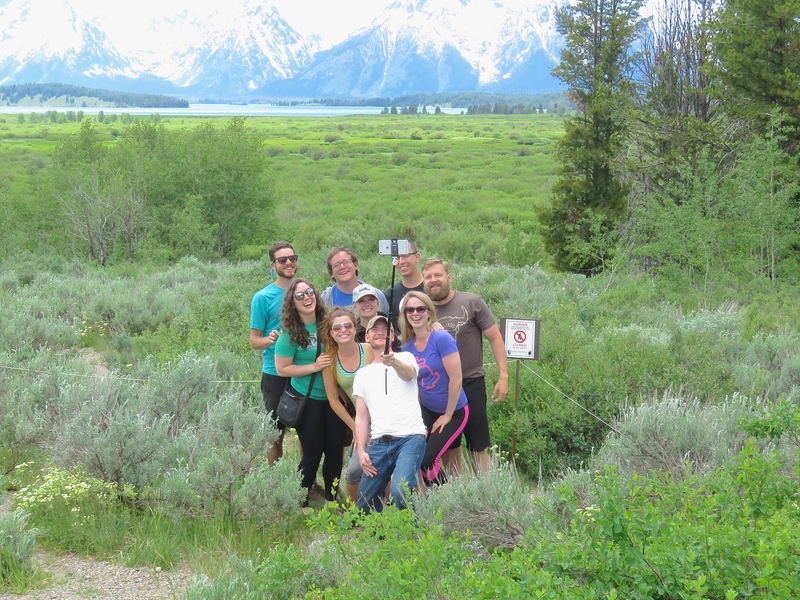 Our second full day in Yellowstone National Park was an active one. We arrived early at the north entrance at Gardiner and waited in line behind a few other vehicles. 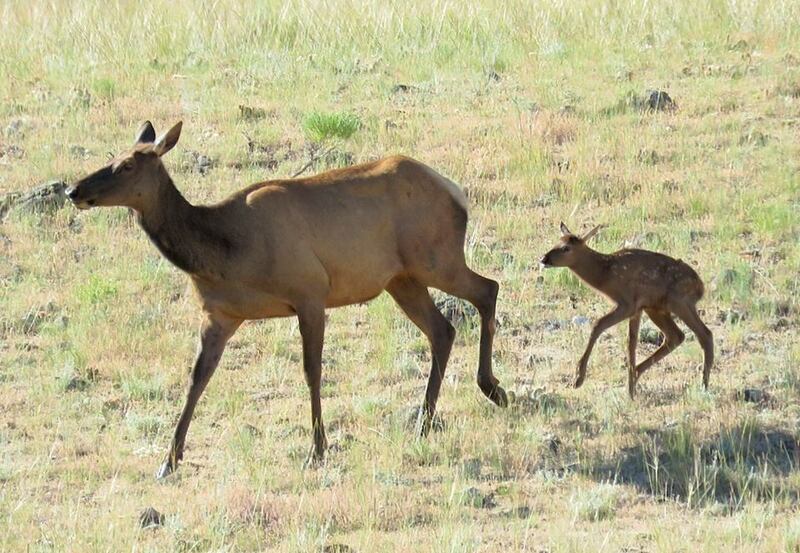 A mother elk came down a nearby hillside followed by her calf, young, wobbly legged and slow. She took her time and allowed it to stay close. Traffic stopped as they crossed. It was a wonderful start to the day. This entry was posted in Travel and tagged Hiking, Nature, Photography, road trip, Yellowstone on July 23, 2017 by Jim R.
Highlights of day 4 of our journey to Yellowstone NP. We stayed overnight after day 3 in Thermopolis, Wyoming. The hot springs there were an attraction to the native residents for centuries. Today they are a tourist attraction. We soaked for a while in the free state park pool. Others cavorted in the commercial facility next door. The flow rate of the springs is much less than in the past. We headed north to Cody after breakfast. From Cody, Yellowstone visitors usually drive west to enter the park. 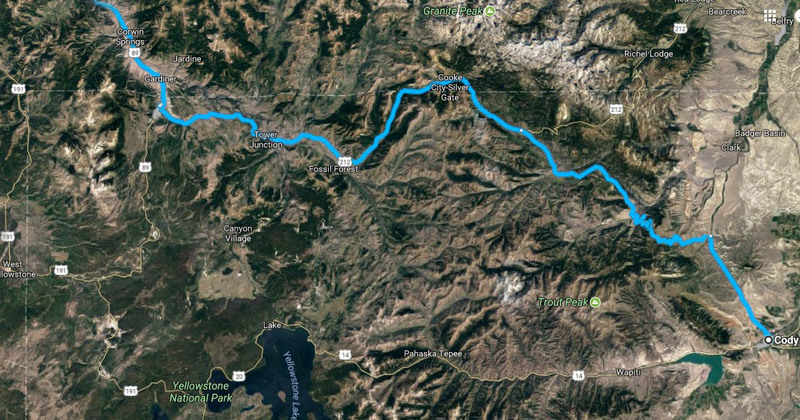 We chose to drive northwest and enter the park at the Northeast Entrance near Cooke City, Montana at the top center of this map. Later that evening we checked into a B&B north of the park. Click to embiggen for detail. This entry was posted in Travel and tagged Mountains, Nature, Photography, road trip, Yellowstone on July 20, 2017 by Jim R.
We stopped in Chadron, Nebraska, for advice about what to see and do. The young woman at the information office suggested Chadron State Park 10 miles to the south. We drove to the highest point in the park and hiked a short distance to a scenic overlook to the northwest. The views were very nice, unlike those from interstate highways. The last part of the video zooms to barely see the Black Hills of South Dakota in the distance. This entry was posted in Travel and tagged history, Nebraska, road trip on July 6, 2017 by Jim R.
Nebraska is a long state, about 430 miles from east to west. We stayed overnight in Sioux City, Iowa, and got an early start on U.S. 20. It would be several hours before we reached our goal for the day, somewhere in western Nebraska. In the past we only crossed the state on Interstate 80. The elevation changes on I-80, across the southern half of the state, are tiny. It follows the North Platte River most of the way. U.S. 20, Bridges to Buttes Byway, took us across the northern counties, different rivers, the Sandhills country, and showed us some beautiful sights. As late as 1967, Valentine was split between two time zones. As described in one news report, “The mountain and central time zones meet at the center of Main Street, so an hour separates the two curb lines.” According to the report, when clocks were required to be set back one hour for daylight saving time, Valentine’s post office (which was in the central zone) split the difference and turned back its clock by only half an hour. By mid-afternoon we reached the town of Gordon and were ready for another break. 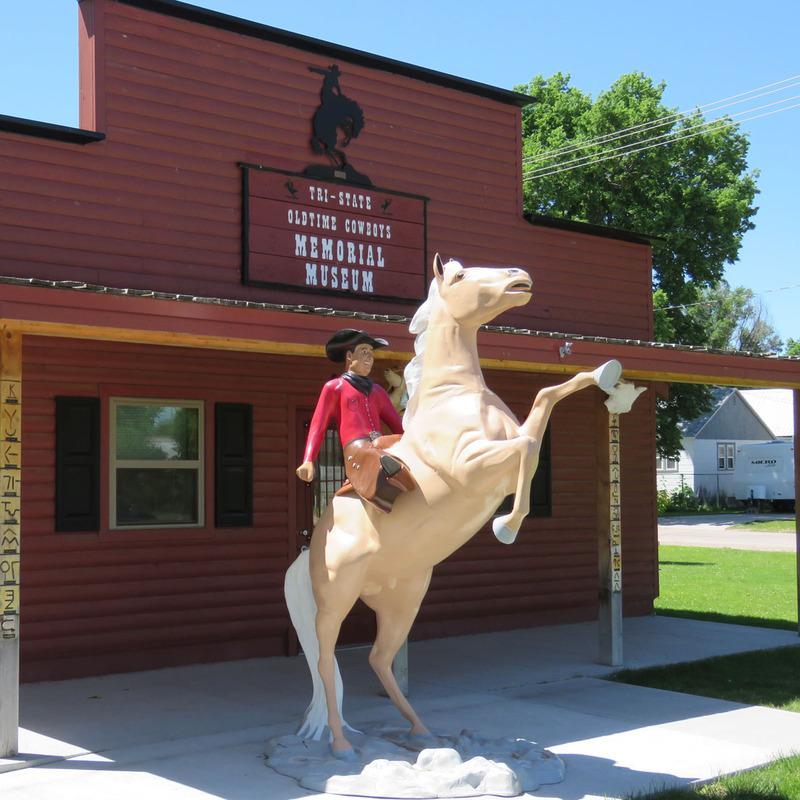 A sign advertised the Old Time Cowboys Museum. We stopped to ask some guys who were fixing a pothole where it was. We didn’t expect much as we turned the next corner. This entry was posted in Travel and tagged Cowboys, Museum, Nebraska, road trip on July 5, 2017 by Jim R.
We recently completed a 3000 mile road trip. Along the way, we saw signs several times a day which denoted an Historical Marker by the roadside. We usually drove on by and wondered what it said. Sometimes we got a glimpse of a few words in the title but nothing else. If we did stop to read, it was when we changed drivers. We started a paper list of things to look up at a later time. The list included some of those historical sites that seemed interesting. The list also included word origins, reminders, funny things to remember, ideas for a blog post, etc. When we got home from the trip, we checked off the items on the list, including some of the historical markers we passed. We checked to see if there was a database available online. It seemed like there should be one since these things are so prevalent. Well, guess what. There is such a database. It is called the Historical Marker Database. Clever title. It is full of information for the traveler and the curious student of history. When you enter the database, you are welcomed by a page loaded with several types of information such as the marker of the week, recently added markers, a tour of the site, most viewed this week, email signup, and much more. The About Us link describes the criteria for markers included or excluded, the names of those volunteering to keep the database up to date, and helpful notes for users who want to submit their own marker finds and information. The whole thing is a volunteer-run operation, which started in 2006. Menus choices across the top look like this. The blue Near You button is very useful. It will give you several options to find markers in your vicinity. They are presented on a Google Map for you to click. Clicks on the red markers in the map yield links to more specific information and location. The Geographic Lists is also very helpful. It lists markers in the U.S. and in many countries. Here is an example of what can be seen using the Near You button. 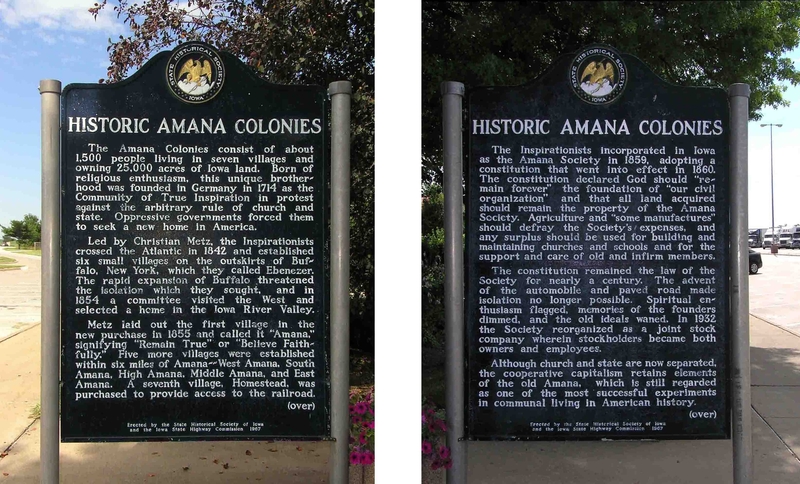 The Amana Colonies are a few miles from our home. Detailed information and an image of the actual marker is included. Take a look a the site. 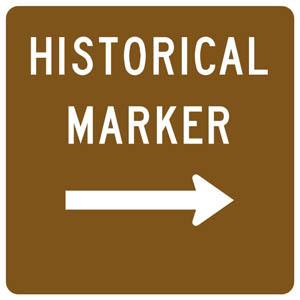 What historical markers are near you? Have you seen them in person? This entry was posted in Travel and tagged database, historical markers, history, road trip, Society on July 2, 2017 by Jim R.
That’s Dubois, Wyoming, pronounced as “Dew Boys,” emphasis on the dew. Born in the 1960s, I was a little too young to enjoy the era of television westerns. The 1950s and 60s were thick with them, but the only one I watched was Bonanza. Oh, those handsome Cartwrights, riding and fighting and oh so unlucky in love. And The Big Valley, with the equally handsome Barkleys, and the strong, tough Victoria Barkley, as played by Barbara Stanwyck. It was a pretty limiting look at the old west. My family never traveled much father west than the Mississippi River, so my view of the modern west was non-existent, too. As I write this, Jim and I are in Dubois, Wyoming. Dew Boys. It’s a convenient stop on our route back to Iowa, after several days in and around Yellowstone National Park. (Yellowstone is breath-taking, and so postcard-perfect that parts almost look fake.) Dubois shows a slice of the west that is both unique and typical of this hard-living part of the country. Surrounded by national forest, national parks, and national wilderness, the town represents some of the small portion of Wyoming that is owned privately rather than by the government. It serves and survives on the summer tourist trade as they move into and out of the parks. Several establishments provide lodging, while others dish up food, alcohol, or art. Our hotel motel is long and low, settled on the highway for decades, across the street from the Wells Fargo bank. Guarding the driveway is a giant black bear, at least twelve feet from snout to tail. The owner’s son told us the bear has always been there, at least since his grandparents owned the place. It’s a remnant of other days, along with the jackalope, the giant steer skull, and a huge trout hanging at the other end of town. This entry was posted in Travel and tagged Cowboys, Dubois, Motels, Quirky western towns, road trip, Wyoming on June 24, 2017 by Melanie McNeil. This has to be one of the most beautiful places on Earth. The sun and blue sky set the scene perfectly. We weren’t the only ones who thought so. This group of young people caught our attention and gave us a few chuckles as they posed for their group selfie. Afterward, I showed them my photo. They gave me an email so I could send the photo to them. The white sign to their right is a strict warning about bears nearby. This entry was posted in Travel and tagged Grand Teton National Park, Photography, road trip, Travel on June 20, 2017 by Jim R.
When this is the first thing you see while waiting in the car at the Yellowstone entrance, you know it’s going to be a good day. We also saw black bears, bison, antelope, coyote, pica, and much more. The scenery is such a marvel. We walked about 2 miles throughout the Norris Geyser Basin. The brilliant sunshine brought out colors of the algae in the hot waters. Our most challenging part of the day involved a hike to the rim of the lower falls of the Yellowstone River. It included a 600 ft descent via a trail that switched back and forth more than 10 times. Of course, that meant you had to ascend the same trail. We are in good shape and made it up easily. Others were not looking so good. Once at the bottom of the trail, we got this view of the rapidly flowing river as it plunged 308 ft to the floor of the canyon. The rainbow was a special treat. This entry was posted in Outdoors and tagged National parks, Nature, road trip, Wildlife, Yellowstone on June 19, 2017 by Jim R.
A few miles south of Livingston, Montana, is Paradise Valley. East of route 89 is a National Forest recreation area called Pine Creek. From the east-most parking lot is a trail that follows Pine Creek upstream. There is an elevation gain of about 460 ft up to about 6100 ft. The trail is often rocky with some tree roots. The trail is about 2.5 miles total out and back. The 100 ft falls tumbles down the rocks and under a simple foot bridge. This entry was posted in Outdoors and tagged Hiking, Montana, Nature, road trip on June 19, 2017 by Jim R.
We decided to hike one of the trails in the park instead of driving from site to site negotiating traffic and crowds. Beaver Ponds Loop was a good choice at 5.4 mile. It started from the terraces at Mammoth Hot Springs and ascended 800 feet through the trees along a creek. Views were offered of the terraces from higher vantage points. The trail emerged into a meadow offering this broad panorama. This entry was posted in Hiking and tagged Nature, Outdoors, road trip, Yellowstone on June 18, 2017 by Jim R.